Coyote volleyball dropped only two total sets in a sweep of their first ever home tournament, the South Dakota Classic, defeating Northeastern 3-0 and California 3-1 Friday, and Northern Colorado 3-1 Saturday. Coyotes overthrew Northeastern 25-21, 25-15 and 25-18 in a three-set game in SD Classic opener on Friday, Aug. 31. Senior middle blocker Taylor Wilson led the team with 15 kills, while senior outside hitter Hayley Dotseth followed with 12 kills and two aces. Madison Jurgens tallied 38 assists and junior defensive specialist Anne Rasmussen defended the opponent’s attacks with 18 digs. 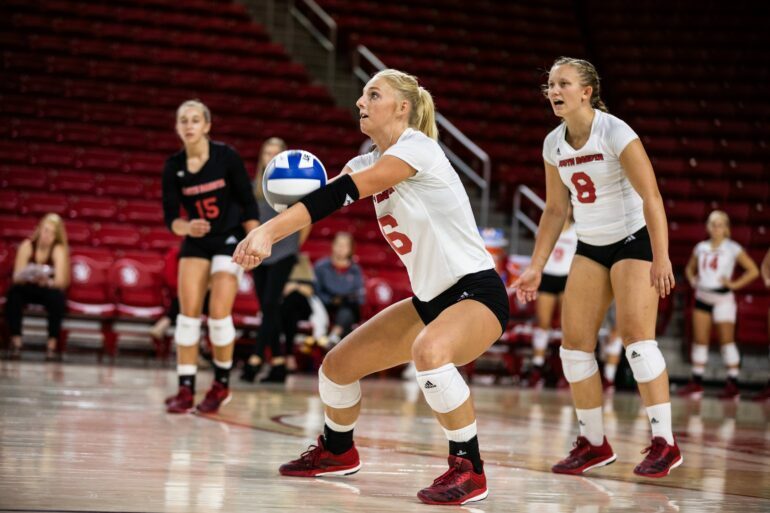 According to GoYotes.com, the Coyotes tallied at least seven total team blocks for the fourth straight match as Wilson had one solo and three block assists while a pair of freshmen, middle blocker Claire Gerdes and outside hitter Jenna Wagemester, tallied three block assists apiece. Game two for the Coyotes ended in great applause as the 3-1 game marked their third win in six matches against a Pac-12 team. No match was won with ease as the four sets finished with identical 25-23 cores. Despite dropping the first set, the Coyotes recovered by winning the next three. Dotseth logged 18 kills on 49 attacks with 17 digs and senior outside hitter Kristina Susak came next with 10 kills. Grathoff tallied six blocks and Rasmussen dug 20 balls. Taylor Wilson, a senior, said topping California was special in her four years as a Coyote, as beating top schools hasn’t happened often. “It was a complete team win, everyone stepped up to the play and we all executed the game plan,” said junior outside hitter Elizabeth Loschen, who completed the match with nine kills, no errors and a .360 hitting percentage. Dotseth said the game plan for match three was simply to win. Coach Williamson said a win like this was huge for the volleyball program. Coach Williamson thanked fans and students for their support and energy. USD volleyball ended the inaugural SD Classic undefeated, sweeping Northern Colorado away 3-1. The Coyotes took the first set 25-15, dropped the second set 25-17, but won the last two sets 25-22 and 26-24. Dotseth took on the attack with 18 kills, followed by Kristina Susak and Taylor Wilson with 12 kills each. Rasmussen tacked a tournament-high of 27 digs. The team ended the tournament with a total of 150 kills, 20 blocks, a .807 hitting percentage and 419 total attacks. During the third set, Lauren Sauer reached her 1000th dig, becoming the 14th player in the history of USD volleyball to do so. Sauer, who missed last season due to injury, said it was a goal of hers since freshman year to excel as a top digger and reaching 1,000 digs was a memorable moment. “It’s really cool, and especially after missing last season, to come back and be able to perform right away,” Sauer said. Taylor Wilson, Anne Rasmussen, and Hayley Dotseth were named to the SD Classic All-Tournament team. Dotseth was named Most Valuable Player. The Coyotes compete at the Central Arkansas Tournament in Conway, AR, next weekend, facing Arkansas-Pine Bluff, Central Arkansas and Little Rock.